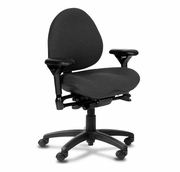 BodyBilt Mid-Back chairs provide exceptional comfort with upper and low back support. 10-Point Posture Control adjustability puts at your command the tools to address and alleviate stressful aches and pains so often escalated by inferior chairs. Ergonomic adjustability and comfort are the cornerstones of BodyBilt seating. The chair features 10-point posture control, which allows the user to control their level of comfort. The seat pan is standard-sized, with minimal contours in the seat.